I'm back again. 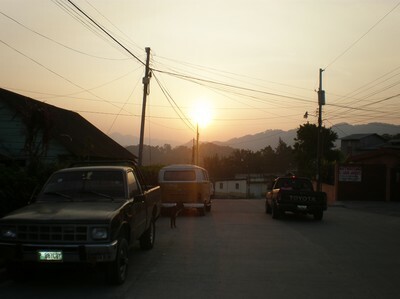 It's a strange feeling and somehow Guatemala allready feels very distant. I'm going to miss it a lot, but I'm also enjoying being back in Sweden again. Thank you for joining me on my travels! Now this blog will get some rest... Over and out. 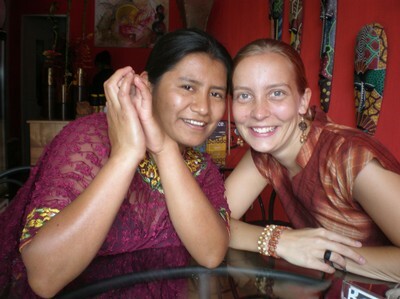 The hardest part is to answer the question "But when will you come back to Guatemala again?". Today I even had to tell one friend not to ask me that question. I'm sorry, but I really don't know if I'll ever come back. Or, I know I have to, but I don't have a clue about when that will be. When a seventeen year old girl, who almost has got no money at all, comes to you in a silent mode, asking again when you'll come back, giving you two pairs of beautiful earrings that she bought for you at the market earlier that day, showing with her whole body that she doesn't want to leave your room and then gives you the biggest hug ever before leaving, how do you react? How do you feel? What do you do? 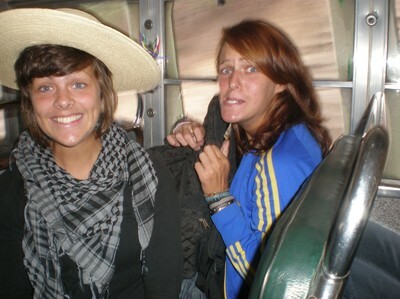 I my self can just try not to show how my stomac hurts and how badly I just want to stay with those beautiful people. For those of you who might wonder, the dinner was great. The whole big "family" here, sixteen people, where gathered to eat meatballs, potatoes, beetroots, dark bread and strawberry cake. It was really nice, and still I'm the worst when it comes to the goodbye-and-thanks-for-everything-part. Well tomorrow I'm off. Three days of travels until I'm back in Skåne. If I don't miss the plane at one of my transits in the States... 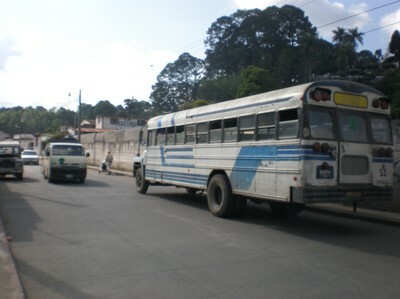 Starting with bus to Guatemala City tomorrow. To make some more goodbyes, leaving a very caring Guatemalan family and one of my very best friends and role models here... 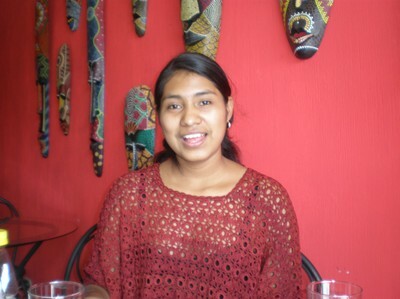 If someone is interested in more news from Guatemala in Swedish just tell me, because this friend will stay here as a peace observer for one year and she'll send out very interesting reports every once in a while! Do you notice that I can't even take a proper goodbye here? Well, untill next time! Thank you. Good night. So, I guess I've started the real countdown for my last days here in Cobán and Guatemala. Today was my last Sunday here (at least for this year...) and I've had a great day! I've been eating cake, laughing a lot and I also had time to listen to a liveband in the shopping mall (you know the German mall looking like a big church...). Since Rosa, la ama de mi casa, and probably my best friend here, has her only day "off" (still preparing three meals...) on Sundays we had to use it well! Da gang! Maria, Rosa, Hector and Gudelia. All up for some cake! Maria, the youngest sister (out of seven). 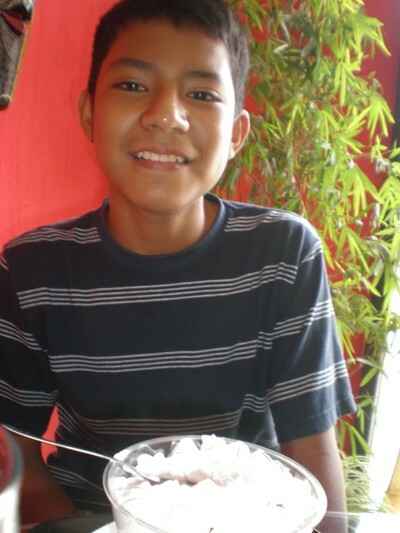 Hector, the youngest out of fourteen siblings, enjoying his "tres leches". Querida Rosa, gonna miss you so much! Felix, look! No hands! 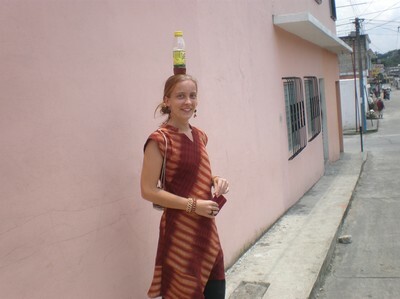 I know it's not heavy, but at least I'm carrying SOMETHING on my head... 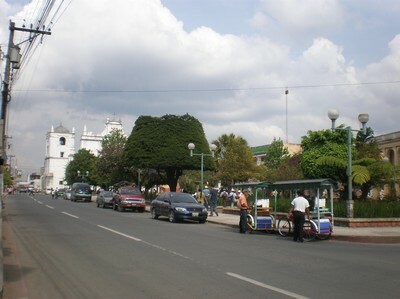 In Guatemala. I'm back! Back in Cobán and back to my computer... I've had one week of wonderful vacations, well spent. I started up with a birthday party in the capital (about four hours in the children's part of Pizza Hut...). Followed by a shorter stop in Antigua to meet up with some wonderful friends, and thereafter with chickenbus to my favourite spot in this country, Lago Atitlán. 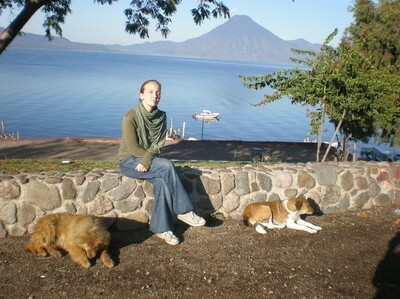 Lago Atitlán, or Lake Atitlan in English, is a beautiful place in many ways. 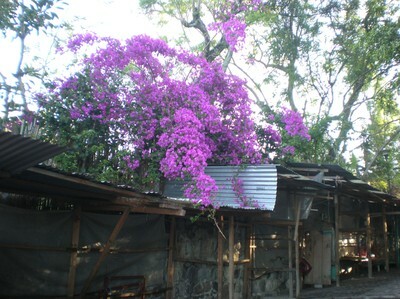 First of all it's situated on about 1500 meters above sea level and surrounded by volcanos. 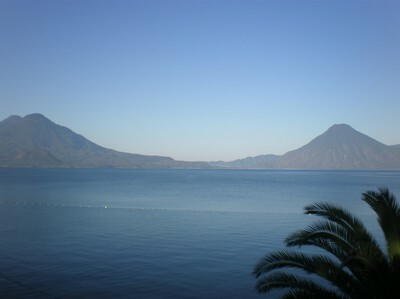 The history of the lake is interesting in itself since it was shaped after an volcanic eruption about 84,000 years ago. 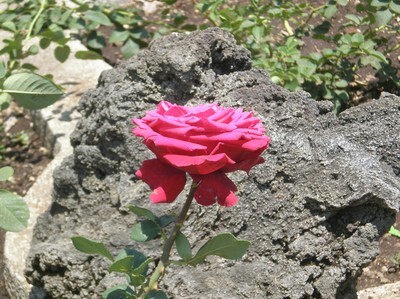 They say that the eruption was so strong it sent ashes all the way to the United States and to Panama... 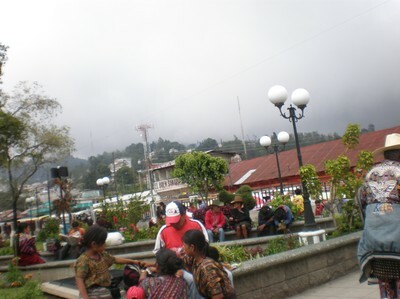 The lake is also surrounded by different Mayan villages, some more turistic than others, and there is a lot of culture and old traditions preserved. 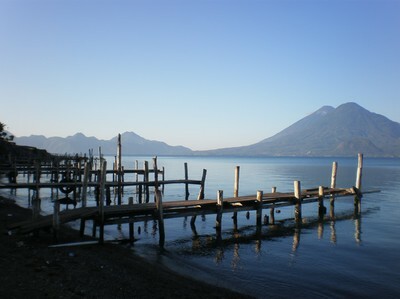 But, for me, Lago Atitlán is also a beutiful spot in Guatemala because of it's quietness. You can actually go here to listen to the nature, to look at the calm waters and enjoy the ravishing view of the volcanoes. It's been great to have time for some tourism, to be able to relax, enjoy, meet friends and just to be. But at the same time it's hard. 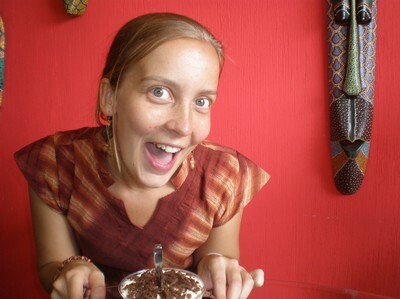 As one of my best friends said (she's now here for one year working as a peace observer): "It's hard to be a tourist here among all those people that I normally work with." Because the poverty, the inequality and most of all, our own power and powerlessness might get even more clear in a small touristic town. And all we can do is to be friendly to the people we meet. Maybe give the begger a coin or two, maybe buy a bracelet from the small Mayan woman, but we can't change the reality here and we have to learn how to live our lives in those strange parallell worlds. But I had a great time, really did! Thanks Katta, Esteban, Lisa and Elin for joining me! It would be so nice if we could do it all over again! And now I really feel that I could start to prepare my self to go back home again. To face a new/old reality and to start processing all the things I've learned here. Just one week left now to finnish it all up! 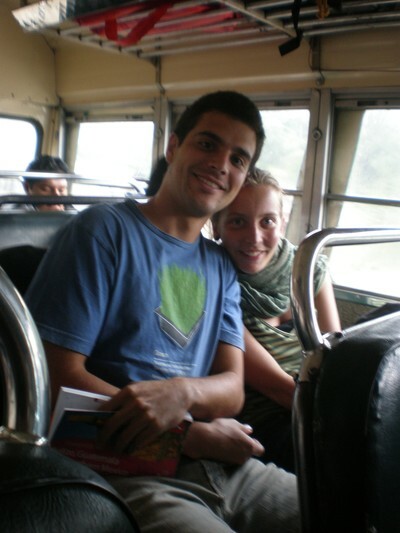 Esteban and me, just realizing the Guatemalan busses are NOT made for tall people (I mean, taller than me...). Colours by the lake. In a few hours there will be vendors here, trying to sell their handycraft to bypassing tourists. Lakeview. In the early morning, before boats and turists arrive. Katta and one of all street dogs enjoying the morning sun. ¡Se fue la luz otra vez! "The light went away again!" is what they say when the electricity goes away. Normally it's connected to the heavy rains. I found it hard to understand the expression first, but in a country where most people don't have electric cookers and where other electronic equipment is very limited it's logical to talk about the light going away. No one here talks about electricity. This time the light went away in the evening, just before the sunset. Soon it was all dark both inside and outside and only the frequent lightnings (and the shopping mall with the huge McDonald's M that never seems to be out of anything) gave us some light on and off. "¡Ya viene la luz!" ("The light is back!") Rosa said happily, lightening a candle in the citchen to be able to prepare the dinner. Now the light is back again and the floor in my room reminds me of a private swimming pool. But we live in a good house. We notice the loss of electricity because we have access to it. And I notice the water leaking in to my room because I actually have good walls and windows surrounding me. A big part of Guatemala doesn't. 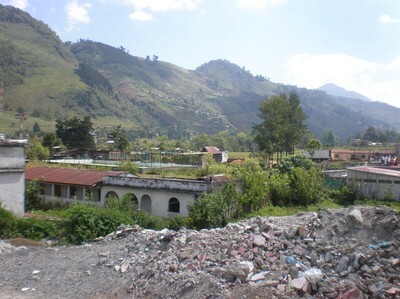 First year when I was here, in 2005, a whole village just dissapeared in te heavy rains. It rains a lot up in the highlands and around the more volcanic parts of the country, and that's also where the poor Mayan people have their homes and grow their crops. Guess who (again) are the most exposed in this country? But any way. I've been here for almost eight weeks now, only two and a half more to go. So it's really time for me to go on vacations, don't you think? 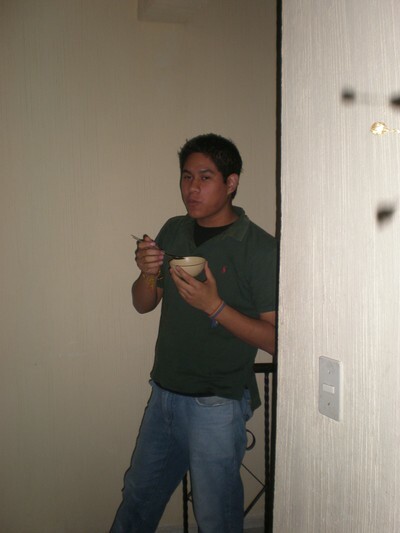 Tomorrow I leave for a birthday party in Guatemala City, after that I'll go to some other turistic, but beautiful and interesting places, trying to stay away from flu and heavy rains. Hopefully together with some really nice people! Wish me luck! 153 deaths so far according to the Guatemalan newspapers, seven according to WHO. Costa Rica is now the first Central American country where one case of the disease has been stated, even if it's nothing life threatening. Guatemala is trying to protect it's borders, representatives from the Central American governments get together to try to find a way to cooperate to not letting the disease spread here. 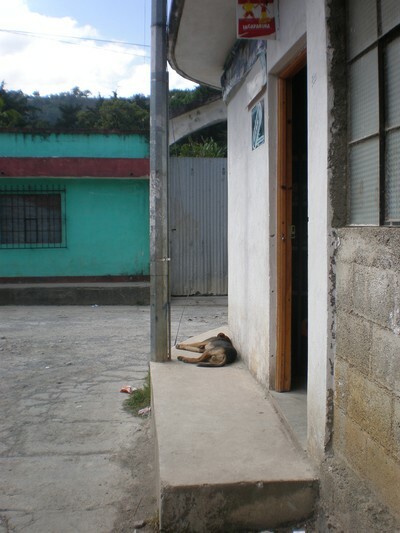 In Guatemala so far there are three suspected cases, but nothing stated. Yesterday I saw all the pictures from Mexico City where people wear masks to protect them selves. Today I saw the first people here in Cobán using the masks. In Sweden they say that the masks are doing no good, that it even can worsen the spread of the disease since it will start to itch after a while and people will use their dirty maybe infected hands to scratch them selves in their face close to mouth and nose. Of course the situation scares me, like it should for people all over our planet, deadly diseases spread through the air is never a good thing and it's a threat to us all. But more than it scares me right now it makes me very frustrated and upset. Why? Well... Where have most of the deaths been stated so far? Why? 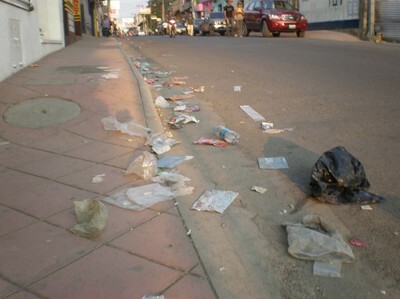 What parts of the world will PROBABLY get most affected of this disease? Why? Keep your hands clean is the advice given to stay away from the flu. And stay away from crowds. 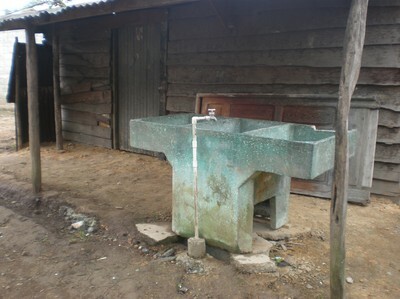 In a country like Guatemala or Mexico volonteers from international organisations are trying to get people to understand the importance of cleaning the hands before eating. At some places there are not even portable water. 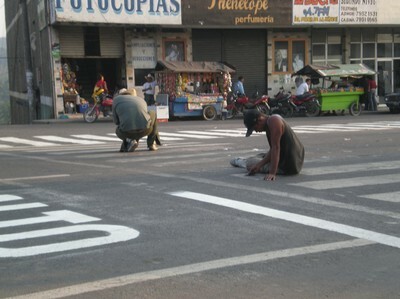 In Mexico City the population is about 22 millions. It IS crowded! 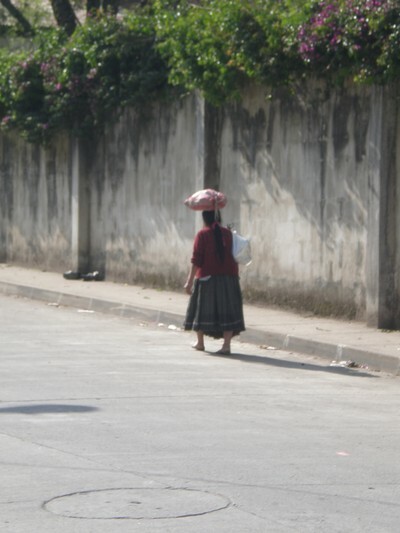 And people HAVE to go to crowded areas to be able to, in different ways, earn their living for the day. Now everything is closed in Mexico City. About 35 000 restaurants and bars had to close down. How will that affect the allready poor people there? 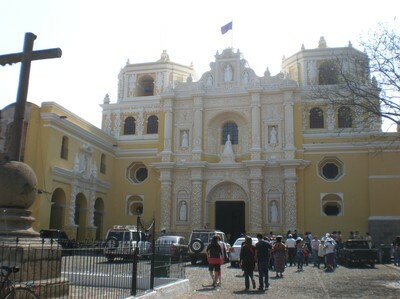 A friend of mine, who is now living and working in Guatemala City, told me she went to the hospital with a friend today. No flu though, but they didn't feel to good going there knowing about the poor medical security and the high risks of infection. People here who can afford it buy masks, but that's all they can do. At the hospital they told my friend there will be medicin comming in for the flu in a day or two. One dose will be about 600 quetzales, or 60 dollars. Who will be able to afford that? I have friends here who are just making it for the day, and I'm seriuos when I say that I actually don't know how they make it to pay their rent and their food. But their worst case scenario is if they, or their kids get very sick, becuase they will probably not be able to pay for a medical control, and if they do, they might not have money to buy the medicin the doctor will recommend. I read something interesting in a Swedish newspaper today. A representative from the Swedish National Board of Health and Security said that "Anyone in Sweden can buy the medicin against the flu to have at home. But of course it wouldn't be to nice to keep medicin for one self if one is not ill..." Sweden today says they have medication for a forth of its population, a bit over 2 million doses. In the UK they say they have about 33 million doses. In Mexico about 150 people allready died. In Sweden and UK everyone is fine so far... So what did you just say about keeping medicin at home if you are not sick? Today the argument from the Swedish government to advise Swedes to stay away from Mexico is that if they get infected they might not get proper care and medication. 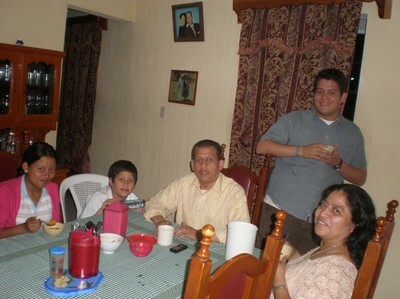 I will leave Guatemala in about three weeks from now and I don't feel to worried about my self. Of cours I'll wash my hands and stay away from crowds, but I will leave for a guarded, even if it's far from safe, Europe, and while I'm still here I have a medical ensurance that will help me if I get sick, even if I know that it can't cure me. I'm not saying I'm safe. I'm not saying anyone is safe. But I'm saying that 50 000 people die every day on our planet from other reasons than age. I was born with a lot of benefits and I can return to my country with one of the best health care supplies (free of charge as well) in the world. 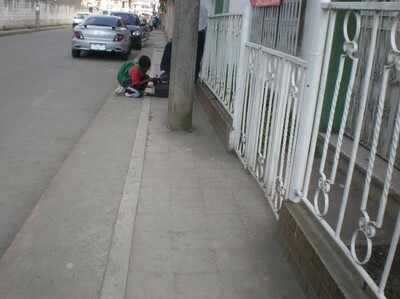 But in Guatemala I will leave my friends who will never see another country, who have to fight to get food for the day, who don't have the possibility to clean their hands once every hour and some of them who can not even read a newspaper since they never attended school. So do I feel afraid? Not to much. Do I feel upset? A bit. Do I just hate the unequality in the world? You bet! 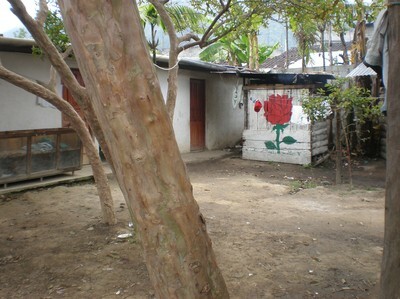 Mi casita, with Rosa always taking care of our home and house. 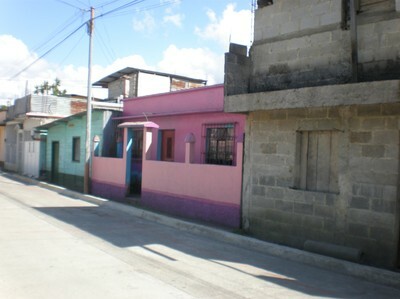 The high school girls that are lodgers here just like me come from all over the north and central parts of Guatemala. 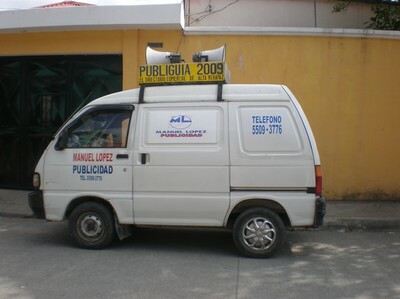 Publicity car with LOUD speakers going around in the streets. 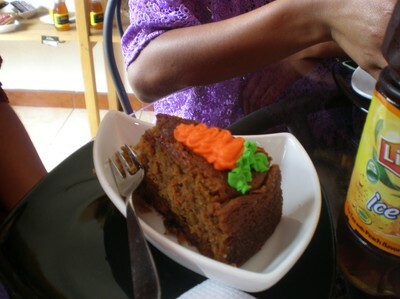 Badly taken picture since I was trying not to show my camera... 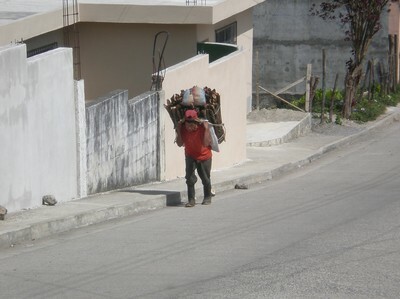 But it's one of all young boys here in Cobán out on his daily work. And this is how we travel, either micro or chickenbus. Except from the stores in the small shopping centre there are not many places where one can find first hand clothes. But if you are fine with second hand stuff, the private 'pacas' with clothes directly from the states are everywhere! I'm sure there are about fifty of them in Cobán, not kidding! And there is no organization in size or colour. But it's cheap! 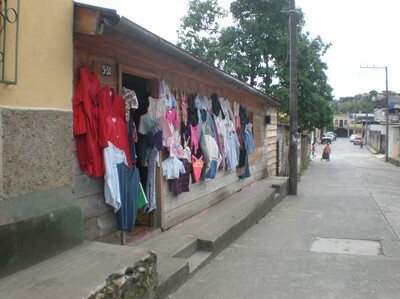 Best pacas sell all clothes for about 10-15Q (1-2 dollars) a piece. 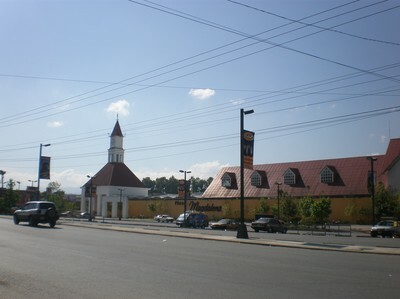 Plaza Magdalena shopping centre. The owners are according to my sources German so it's built in German style... I don't know, someone else than me thinking of a church..? At least it's next to McDonalds! ... to be able to re-paint it! Somehow I just got so happy when I found this on the parking lot outside the mall close to where I live, and I just felt like sharing it with you. In Sweden we have normal parking lots and those marked with a man in a wheelchair, where you have to have a handicap AND a speial permit to be allowed to park. I think I recall seing some parking lots marked with a small family where obviously families (with "familiy cars" in North American SUV-size) are alloud to park. But this is definitely something new! 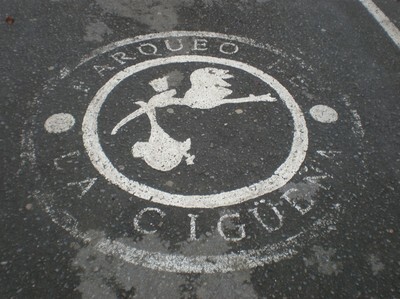 It even says "parking for the stork". The question is just why the stork would want to park here? Is this the place he's supposed to leave the baby at? Is this where the baby get "delivered"? Help me out here!!! Makes me a bit confused, but mostly happy! In the strange, cold country, far far away where I'm from, it's normal to have one surname. Before my parents got married my full name was Jonna My Håkansson, with the surname of my mother. But when my parents decided to marry we all changed to my fathers name, Andersson. Having the same name within the family in Sweden is a way of showing unity, that we all belong together. Some have two surnames, mostly as a way to keep their own names when they got married or maybe if one have divorced parents, correct me if I'm wrong. 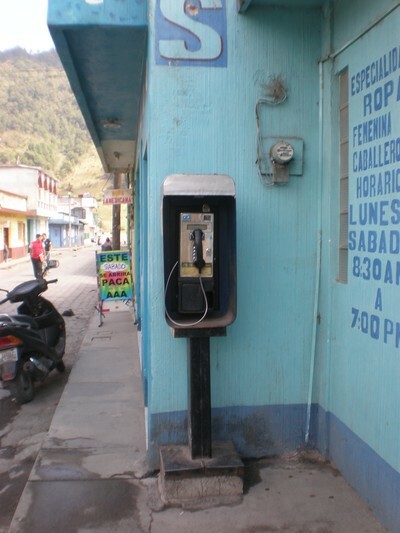 Here in Guatemala, and in most latin cultures, it's almost the other way around. Here the system is made for two surnames, one from your father's side and one from your mother's. If I would have been born here, my name would have been Jonna My Andersson Håkansson, showing first my father's name and then my mother's, always in that order. It shows your heredity, it tells the people you meet about your family and your history. But what happens if you get born by a single mother? Well, almost all children getting born in Guatemala do have a father, somewhere. Even if the parents don't live together the father can still register his name for his child so that it gets one name from each parent. But the father has got to do it. He's got to go to the municipality to register for his child, it's not enough if the mother goes there. If the father refuses to give his name to his child, or if he simply deny that he's the father of the child (and this happens a lot here...) the mother has to start a process against him, proving that he actually is the father. 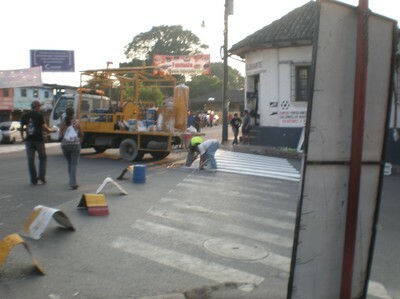 This will take a lot of energy, a lot of time (bureaucracy in Guatemala is cooooomplicated stuff...) and it can get expensive. So why would the single mother even care about getting the father to registrate his name for their child? Isn't it just easier giving the child only the mothers name? Well... First it's about tradition and structure. The system is not made for persons with just one surname, that means the child of a single mother will get registred as her sister or brother... At least when it comes to the name. Because the child will get the same surnames as it's mother, that is first the name of it's mother's father and then the name of it's mother's mother. And in the register it will look like they're siblings. This will also make it obvious that the child doesn't have a father. In school they might just use one surname for those kids, excluding them from what's normal here. And it's not a got thing not being normal, not following the traditional structure. Being a child without father will mean a lot of disgrace and reasons for the other children to bully the fatherless child. And of course it's also about money. Somehow it always comes down to money. 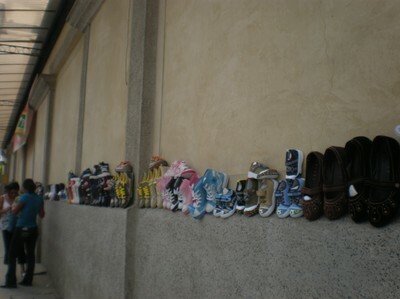 By register the father's name to the child it confirms that there is a man taking responsibility for the child's life. And in a country ruled by the laws of machismo, the man is the one making money and taking care of his family. So bearing the fathers name also means that the child will be, by law, entitled to economical support by its father. Unfortunately this is a system that isn't followed to well. The mothers that I've been talking to, who actually managed to persuade the father of their child to go register their name, still doesn't get any support from the men. And in a country with 98% of all crimes being unsolved, there is a long way to justice. A long way for the fighting, single mothers and their children to get the support they're actually entitled to. So if you ever travel in Latin America and they look strange at you when you say that you just have one surname, don't be surprised. Here it's not just a name. It's about culture, it's about pride, it's about responsibility and it's about survival. With just one surename you will probably also mess up the whole registration system! I've been gone for a while, having vacations. 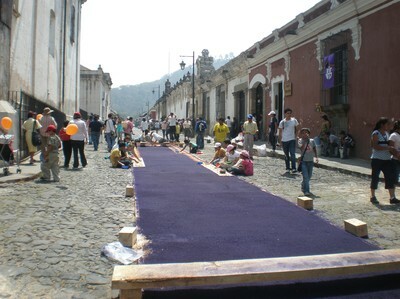 I've been to Antigua, the old capital of Guatemala, to celebrate Semana Santa (the Holy Week). It's been great! Nice with some change, to see a new place (new for this trip at least), meeting new people and most of all experience a totally new tradition!!! ... and I didn't get disappointed. 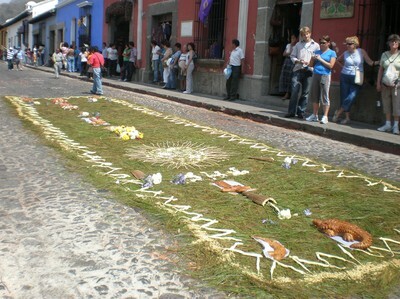 The Guatemalan easter celebrations are a beautiful mix of Catholic traditions and pre-colombian Maya traditions. The streets are filled with people during the whole week, both day and night. 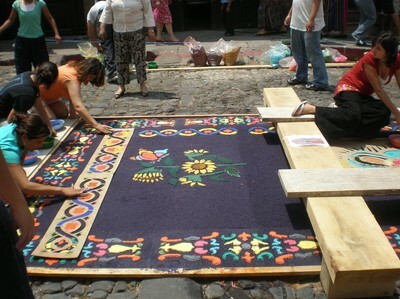 There are groups decorating the cobblestone streets with straw and sawdust in all colors possible. 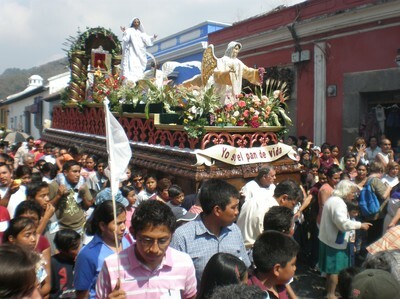 Delegations from different churches (and as you allready know there are a lot of those...) dress up in beautiful lilac dresses (black for Good Friday) and walk in long slow processions through the city, carrying Jesus, Mary and other important figures on big thrones. 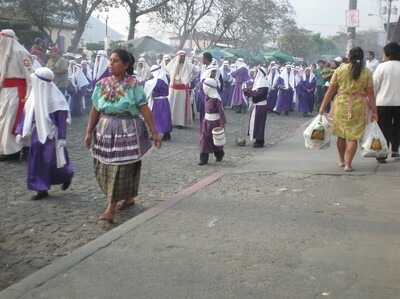 There is also a lot of incense and music following the processions. 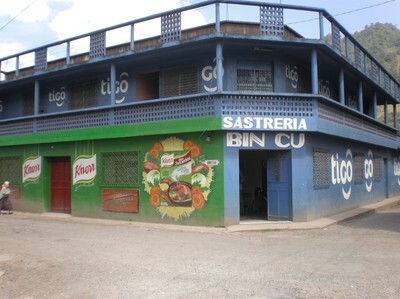 Antigua, ready for the celebrations! One of all the churches. 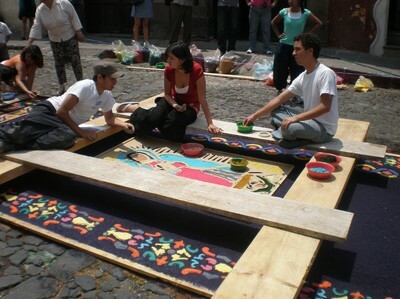 Preparing the way for the saints. 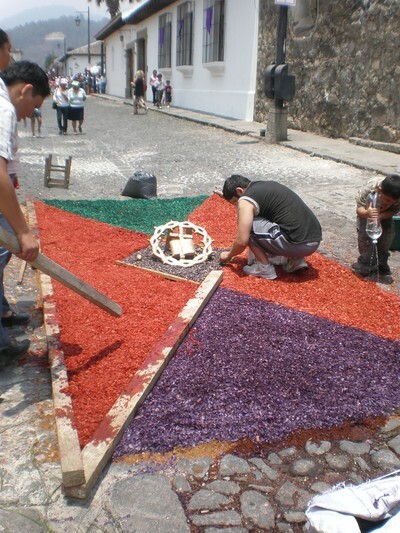 Another kind of 'alfombra'. 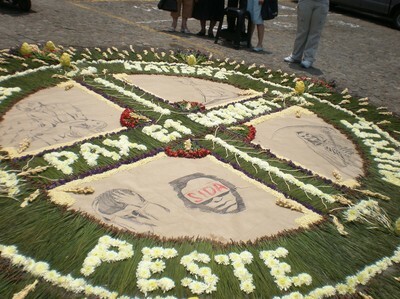 Showing suffering through the themes 'guerra' (war), 'hambre' (hunger), 'peste' (pest, like SIDA=AIDS) and 'muerte' (death). A lot of water and work is needed. 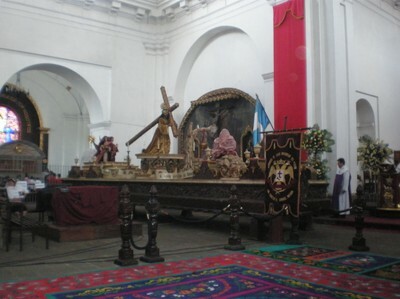 Inside the church. Well, no, it's not a carpet. 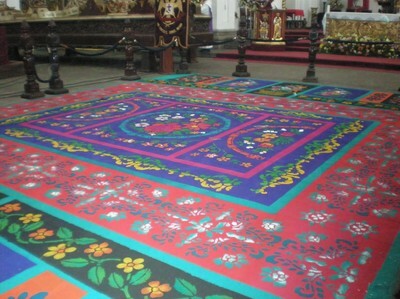 It's another hand-made 'alfombra'. 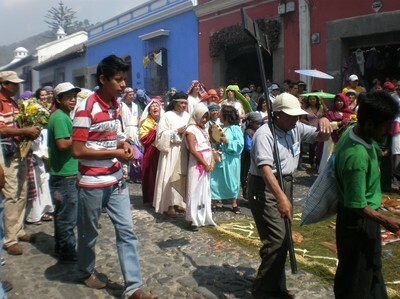 People in procession on Holy Wednesday. This is what they will carry around later on in the streets on Maundy Thursday. Awaiting the procession on Easter Day. Happy people on Easter Day. 'I am the bread of life.' Hallelujah. 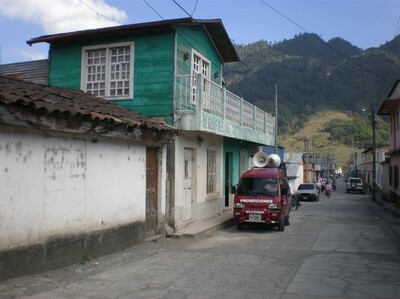 About 1500 meters above sea level, in the central highlands of Alta Verapaz, lies the market town of Tactic. 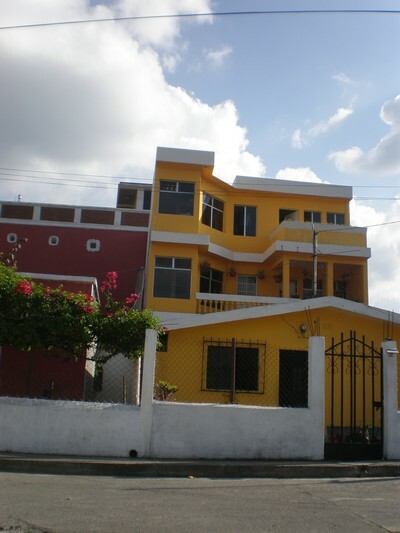 In the whole department of Tactic lives about 25 000 people, in the town just about 7000 people. 70% of those are Poqom'chi Mayan. 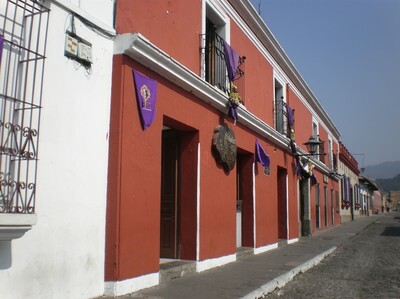 Poqom'chi is one of about 20 Mayan languages spoken in Guatemala and before the Spanish invation 1524 Tactic was an importan Poqom'chi centre. 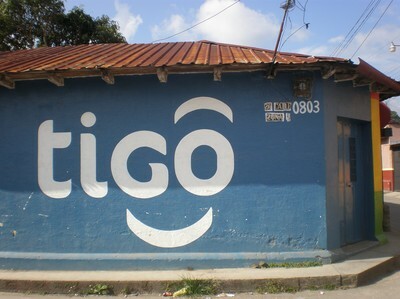 Today not even 45% of the urban population of Tactic learns to speak their own language Poqom'chi in their homes, instead their parents teach them Spanish so that they will be able to go to school, use public hospitals and so on. That makes a big part of the population more or less illiterate in their own language. 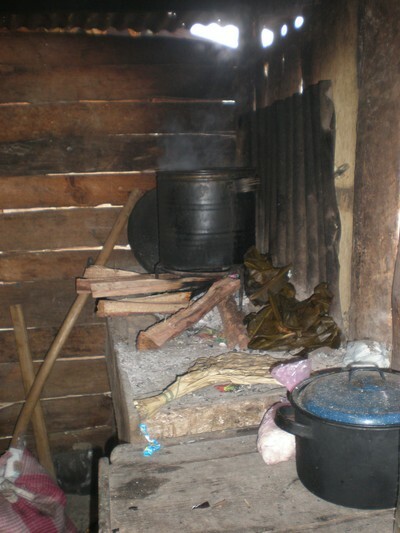 As in the whole of Guatemala the powerty is widespread in Tactic, but in comparison with the rest of Alta Verapaz the poverty is low here. 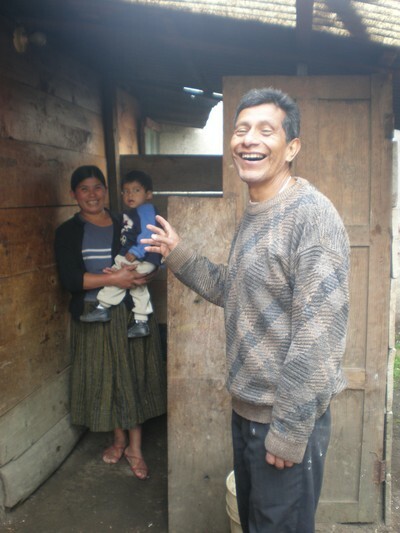 "Only" 64,3% in Tactic are living under the poverty line and "just" 18,2% are living in extreme poverty (The medium rate of people living in extreme poverty in Alta Verapaz in total is about 41%). The standard of time spent in school for people here is about six years but 23% of the grown up population doesn't have any education at all. The main reasons for not going to school is that the children or the parents don't want to, the cost is to high and the children have to stay home working. 11% of the children aged 7 to 14 here are working. Tactic is also the town where I'm conducting my field study. About 20% of the mothers here are singles, trying to get their small families to survive despite the machismo and the conservative society. 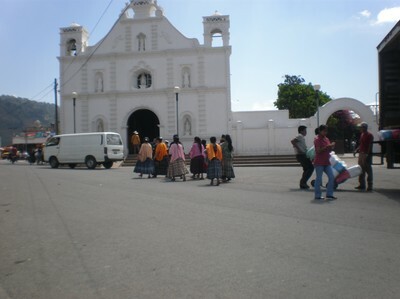 The small town has got fourteen churches and is, as you allready know, 'en el camino del narcotráfico'. Tactic is also a beatufil oasis where I love to go to get a break from the city of Cóban. It's surrounded by a beautiful, green landscape. 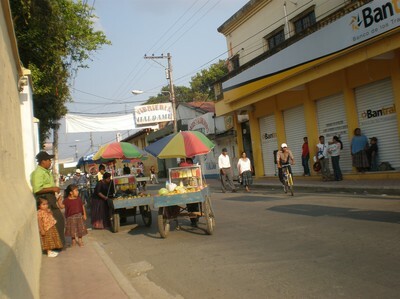 The feeling in town is very tranquile and the market close to the central square is like a world of it's own. Summer's here. When I first arrived it was cold and rainy, I had to sleep with dubble blankets and I sometimes even wore my hoodie after sunset. But one day the summer decided to arrive. So now it's realy hot! I haven't seen a cloud for a week now and the sun is very strong. 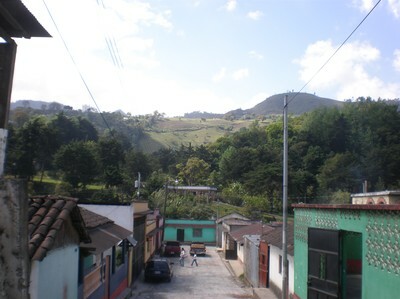 Since Cobán is situated almost 1500 meters above sea level you notice the difference the sun makes pretty fast. But don't worry mum, I wear long pants (With a skirt climbing over people in a crowded micro? Don't think so...), shoes (In my beloved flipflops I wouldn't be able to walk far enough. ), t-shirt (Sometimes even a longsleeved shirt. Would never even think about walking around in just a top showing my shoulders though, what would people SAY?!) and my hat (Actually mostly to protect my eyes). But now I've found my oasis. My own sundeck! Parts of the third floor in our house is an open roof. That's where I go when I need some new energy. Isn't it just amazing what a difference some sun can do? Again I'm the strange foreigner sitting in the sun when everyone else preferes to stay in the shadow. How can I ever explain to them what it is like living in a land of darkness and winter half the year? How can they ever understand what happens to the Swedes when they get some sun? This strange change of personality we notice every year when the sun starts to heaten up our could Swedish souls? How will they ever understand it here, in the land of "eternal spring"? Guatemala is a country marked by a long history of oppression and racism. 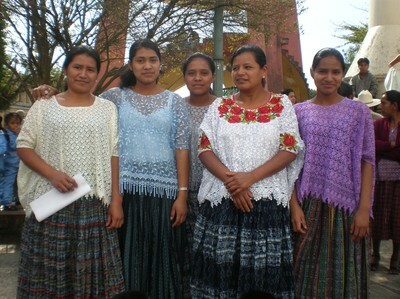 Ever since the Spanish invation 1523 the Mayan people here have been persecuted, threatened and killed. A few landlords and politicians have had the power over the whole country. 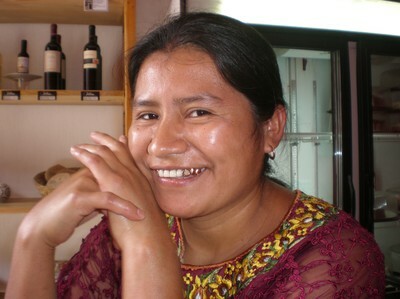 The Mayan people, who always lived and cultivated the land here suddenly got driven off their own land by greedy, powerful men, aiming to make more money on their poor fields. 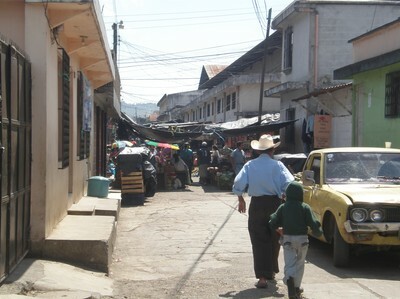 Today about 50% of the Guatemalan population lives in poverty. About 15% of the population lives in extreme poverty, and out of those about 70% are indigenous. A couple of years ago Bill Clinton officially apologized the Guatemalan people for the suffer that his country had caused them during and after the coup d'état in the year of 1954. And this apalogy is the reason for my headline to this text. It's all about the connection between the US government, via CIA, and the United Fruit Company. 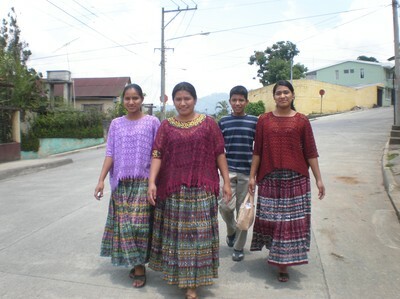 In 1944 2% of the land owners were in charge of 72% of the land in Guatemala. 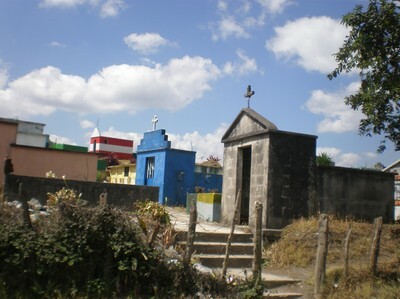 More than 75% of this land was not in use at that moment, while a lot of Guatemalan people were starving to death. The biggest owner of this land was United Fruit Company. They controlled both the railways and harbours in the country and 90% of all export went directly to the USA. Through not using a big part of the land, the land owners can make sure that they will get cheap labour to keep prices down. 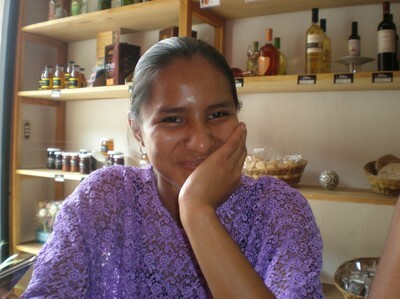 At the same time United Fruit Company didn't almost pay any taxes at all in Guatemala, they could import whatever they wanted without paying any duties AND, they had the right to kill their workers if they for example wanted to start a union. But a coup 1944 changes all this. The people were tired of being opressed so they chose a new leader, the first democraticly chosen politician in the history of Guatemala. Through a change of political leader they also got a bit more power over their own lifes, among other things the new Guatemalan government bought all the unused land of the big companies and let the poor people lease it for their own survival. Those political changes, that helped about 100 000 families, lasted for about ten years. Those years are still talked about as the decade of democracy, the years of hope, and the best years in Guatamalan history. But it ended abrupt in 1954 with a new coup. This time the coup that Clinton apologized for. United Fruit were loosing money, people started to find other jobs, they'd lost a lot of land and their private railway started to get concurrense by public constructed roads. What to do? They now happend to be connected to the CIA and therefore also the US government. 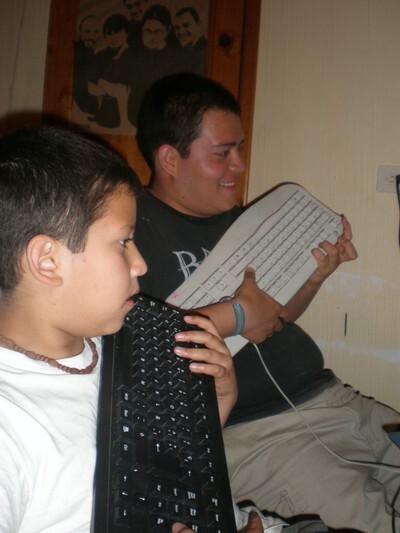 A campaign started about Guatemala being a threat and a big Communist state. 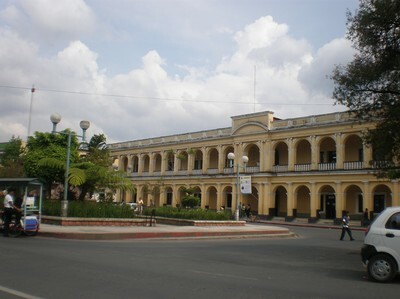 In Guatemala rumours were spread about secret actions made by the government, rumours, with a little help of weapons and money, that helped supporting the coup in 1954. In 1985 United Fruit Company changed name to Chiquita Brands International. So, is there still anyone wondering why I choose ecological and Fair Trade bananas instead of Chiquitas perfect yellow ones?